I bought a new book last week called “The Everything Low Cholesterol Cookbook” by Linda Larsen. Not by choice but because it’s time to start eating better than what I’ve been doing. I have an iPhone with the MyFitness app that tracks all of your daily food intake, by calories, fat, sugar intake, your workouts, etc. I was using that app faithfully until I felt like I was at a point that I knew what I was eating and didn’t need it anymore. But then I started slipping. I’d go to the store and buy candy like it was never going to exist again. I’d buy a box of Mike and Ike’s and eat the entire thing in one sitting. I’d have an ice cream cone every night for a snack. Instead of eating fruit or veggies for an afternoon snack, I’d eat the candy bar I had sitting on my desk. Then it was time to have the cholesterol levels taken. I told myself it would be fine. I’ve been watching what I ate; I’ve been working out. And I wasn’t doing those things to lose weight. I was doing it because I have had high triglycerides in the past. So when I got the results that same dang day that I got tested, read the note that I needed to be on a low fat, low cholesterol diet <shaking head – sighing>, I went to the store and found this book. It’s not like I eat terrible. I have my low fat yogurt for breakfast and I eat a salad every dang day for lunch. (Yes I frequent Zantigo on a regular basis, and will continue to do so – just not as often). I thought I was cooking pretty decent meals. That is until I realized that home made pizza probably wasn’t the greatest dinner to have once a week. Adjustments had to be made. I knew if I wasn’t eating healthy, then neither was my family. And that’s on me! I got this cookbook and went through it deciding I would make at least 2-3 meals per week from it and see how it goes. I stopped drinking the “occasional” soda, I’ve had two pieces of licorice since last week. I bought yogurt ice cream and gelato which hardly has any sugar in it. That’s my issue is the sugar. I like candy, I like soda, I love cheese…I love all the things that should be eaten in moderation, not on a daily basis. As I’ve said, I’m not trying to lose weight, I haven’t been. I’ve walked and worked out faithfully for a long time to try and keep my numbers at a normal level. But I slipped. I fell off but now I’m back on track. Is it hard? Sure is. The kids wanted to buy a snack at the store today with their own money. I stood there thinking, I could eat one of those bags of M&Ms, one of those Heath bars, then maybe go to Dairy Queen and have a blizzard! But I didn’t. I stood strong. (I will have those things…just not as often as I did). I want to enjoy food and the treats that are there for me to enjoy, but I also have to watch what I eat if I want to stay healthy. A lot of the recipes in this book sound pretty good. There is a Peach and Raspberry Souffle. 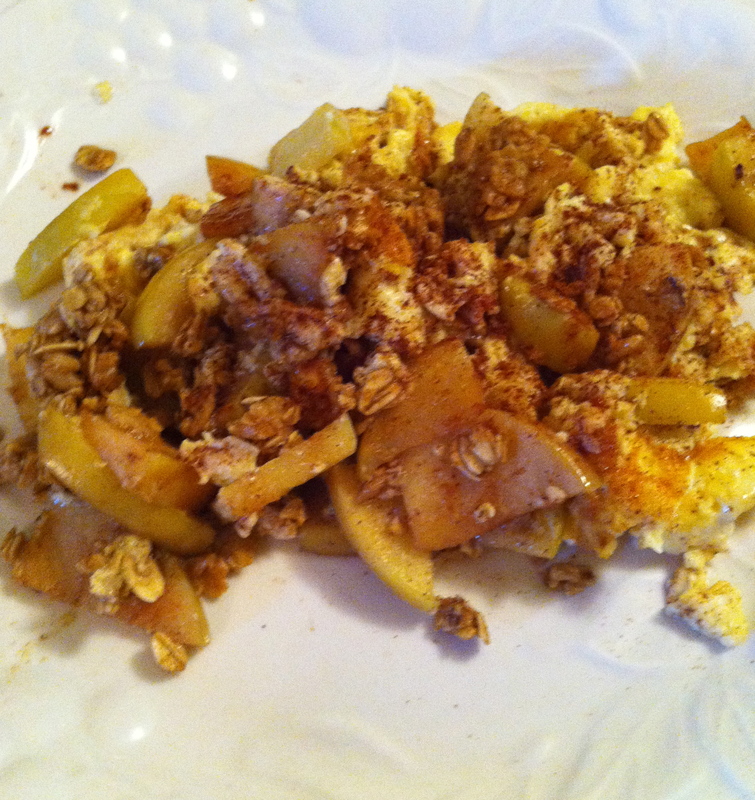 On the next page is the Dutch Apple Omelet. I gave this one a try tonight and even the kids loved it. My only problem with it? I’m so not good and flipping the eggs in half to make it look pretty. But it did have flavor, it did fill me up and I will make it again. 1. In a large nonstick skillet, combine apple slices and water. Bring to a boil over high heat, reduce to low and simmer for 4-5 minutes until apples are almost tender. 2. Drain the water and add butter, brown sugar, and cinnamon to apples; cook and stir over medium heat for 1 minute. Arrange apples in even layer in skillet. 3. In a large bowl, combine egg substitute, egg whites, and milk and beat with eggbeater or wire whisk. Pour into skillet and cook over medium heat, shaking pan and lifting edges of omelet occasionally, until browned on the bottom and set but still moist on top. Sprinkle with cinnamon Granola, flip in half, slide onto serving plate and serve immediately. Give it a try. If anything, you’ll have a healthy meal for the week!